Please enlarge your screen to read this letter. Disclaimer: Rose is a friend of the author, BUT no one to date has detailed the book’s contents more rigorously than she has. The author has framed this letter and placed it in a position of prominence in her home. Last month, I had the opportunity to visit the museum at Vilar Formoso. What was created there was so moving and memorable that when I stepped in the door, I started to weep. A museum made for us- It was that emotional Every step and exhibit was designed with the refugees and their families in mind. The photos, facts, videos, and interactive screens taught me about the people and the events that I never even knew were part of our story! I cannot wait to see it again this summer. “Journey on the Road to Freedom” Space is Limited*! Retrace the footsteps of Aristides de Sousa Mendes and the refugees of 1940 beginning in Bordeaux and ending in Lisbon. Visit sites germane to the dramatic and moving story, including Bayonne, Hendaye, Vilar Formoso, Cabanas de Viriato, Porto, and Figueira da Foz** along with Sousa Mendes grandchildren and visa recipient families. **Preliminary itinerary. Program subject to change. Joan with UNESCO teachers - Dores do Carmo, Lurdes Cruz and Josefa Reis - and student presenters. Joan with presenters and audience. Mariana Abrantes, Luso-Americana and Treasurer of the Sousa Mendes Foundation with Dores do Carmo and Joan. 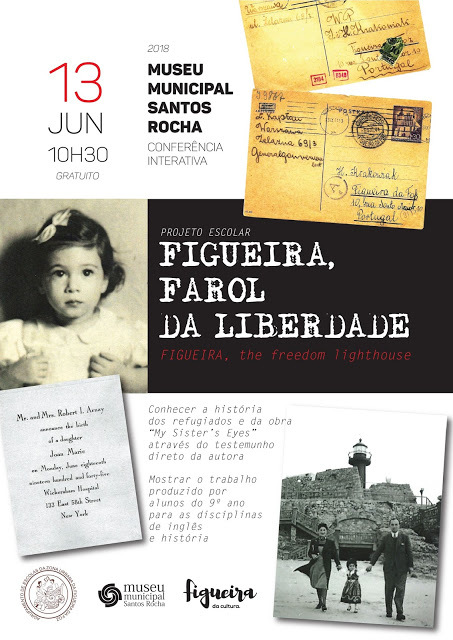 Joan Arnay Halperin brings her family's story of rescue and loss during #WWII to Figueira da Foz and Carregal do Sal on an educational book tour. Students and teachers listen and react and the press takes notice. 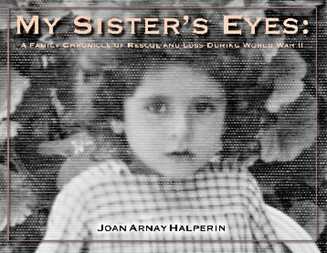 How to BUY My Sister's Eyes: A Family Chronicle of Rescue and Loss During World War II! Preview the guided tour of the "Fronteira da Paz Museum" - Vilar Formoso, Portugal. Learn the destinies of refugees who fled Belgium and France in the thousands to find safe haven from Nazi terror in Portugal in 1940. 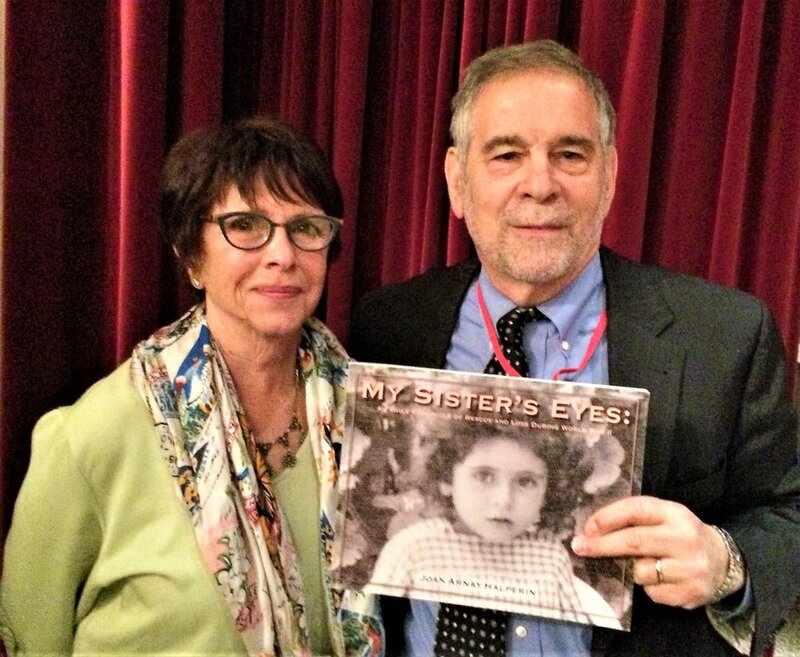 BUY My Sister's Eyes: A Family Chronicle of Rescue and Loss During World War II at their museum shop or the Sousa Mendes Foundation's store to learn of the Krakowiak family's rescue by Aristides de Sousa Mendes. Yvonne Krakowiak's Minho yarn doll on display at the Fronteira da Paz Museum in Vilar Formoso, Portugal. Picture above: Alberto Malafaia, Hala and Ignas Krakowiak with the automobile the Krakowiaks drove to safety (c. 1940-41). Pictured below: Hala and Ignas seated in front of their barrack at Gibraltar Camp, Kingston, Jamaica, where the couple found refuge after they were evacuated from Portugal on January 24, 1942. Aristides de Sousa Mendes visa recipients and grandsons were welcomed by President Marcelo Rebelo de Sousa during the Sousa Mendes Foundation's 2016 - "Journey on the Road to Freedom" visit to the Presidential Place, Lisbon, Portugal. L-R: Gerald Mendes, Stefan Rozenfeld, President Marcelo Rebelo de Sousa, Lissy Jarvik, Sebastian Michael Edward Mendes, Antonio Pedro Moncada Sousa Mendes. "Uprising" the film directed by #jonavnet is a powerful statement about the courage of the men and women fighters of the Warsaw Ghetto Revolt. "Uprising" Q & A with Dr. Michael Berenbaum (l.), director Jon Avnet (c.) and actor Jon Voight. Voight, who plays a Nazi commander in this film. Voight, a man who loves #Israel. explains how his deep appreciation of the Jewish peole came about. Lolek Kaplan (above), a soldier in the Polish Army. was taken prisoner at the Battle of the Buza River, Warsaw, Poland in September 1939 and sent to Stalag IIA, Neubrandenburg. He was later released and incarcerated in the Warsaw Ghetto. 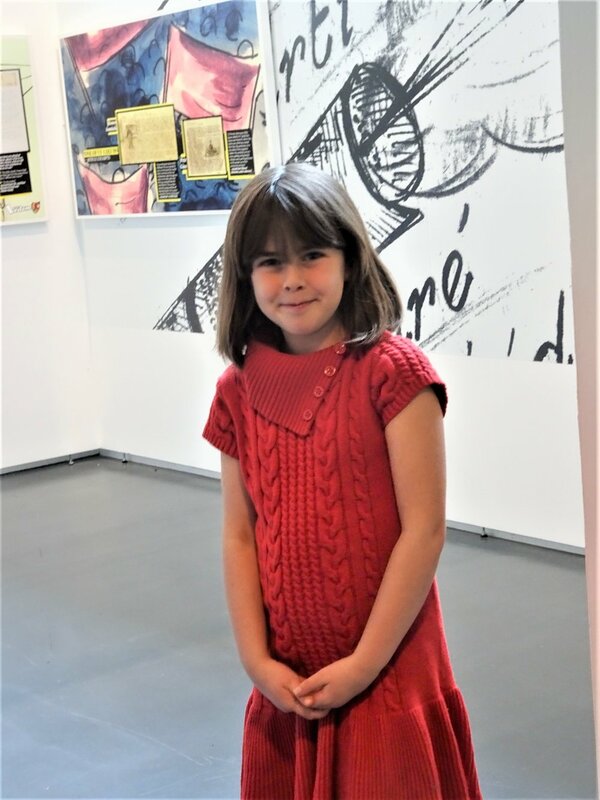 Great-granddaughter of Sousa Mendes visa recipients Hala and Ignas Krakowiak pictured below at the current exhibition: Vedem: The Underground Magazine of the Terezin Ghetto. Here she is presenting copies of My Sister's Eyes to April Slabosheski (center), Director of Education at OJMCHE. Her grandmother and author of the book, Joan Arnay Halperin, looks on with pride. OJMCHE makes Holocaust Educational Trunks available to middle and high school teachers for use in their classrooms to study Holocaust Rescuers among other subjects. Joan's presentation of My Sister's Eyes , the story of how her family was rescued by Aristides de Sousa Mendes, to the Confirmation class of Congregation Adas Emuno was one such occaision. Rabbi Barry Schwartz, the religious leader of the congregation, is a good teacher. This was evident by the thoughtful follow-up questions he posed to Joan and the class. Rabbi Schwartz is also a prolific writer as well as director of the Jewish Publication Society in Philadelphia, the nation's oldest and best known Jewish publisher. The society has just published Dr. Mordecai Paldiel's latest book, Saving One's Own , which recounts the stories of Jewish Resucers during the Holocaust. My parents, Ignas and Hala; my sister Yvonne; my Uncle Hipek and Aunt Zosia; and my grandmother Julia Krakowiak are not listed on any of the Portuguese Consulate register pages created during those tumultuous days in 1940, when Aristides de Sousa Mendes gave a second chance at life to thousands of desperate refugees. This testimonial recorded on January 1, 1989 in New York is proof that my family was among them. Hala died never knowing whom to thank. Aristides de Sousa Mendes died never receiving the expressions of gratitude that thousands would have liked to have shown him. This is my homage to them. June 13, 2018 ---- Be There or Be Square! Photos and stories that did not make it into My Sister's Eyes will be shared with Figueira da Foz's, Escola Básica Dr.João de Barros, teacher Helena Romão and her students who used the book to learn about one family saved by the #Portuguese #Holocaust rescuer Aristides de Sousa Mendes. Many thanks to Arquiteta Luísa Pacheco Marques curator of the Fronteira da Paz Museum for the care shown to my sister Yvonne's Minho yarn doll, a parting gift from Alberto Malafaia, Portuguese friend of the Krakowiak family. Alberto Malafaia (standing above left) , Hala and Ignas Krakowiak, Figueira da Foz, 1940-41. Tell me honestly, if you can find a bettter example anywhere. Google images for vintage Minho yarn dolls. Speaking to an engaged group of 6th grade students who have already visited the Holocaust Memorial and Tolerance Center of Long island and heard the testimonies of two Holocaust survivors, Joan had the priviledge of sharing the story of how the #Holocaust hero, Portuguese Consul General Aristides de Sousa Mendes, saved the lives of thousands of desperate refugees by issuing visas for safe-haven in Portugal. The Chatterton School in Merrick, LI, NY is an example of the New York State school system at its best. Keep up the good work. #NEVERAGAIN. Congratulations to Íris, Patrícia, Catarina, Inês, João, Beatriz, Afonso, André, Matilde, and Duarte..
já começaram as suas micro-pesquisas, sobre personalidades da época do Holocausto (who have started their micro-inquiry into personalities of that time. ?? How's my Portuguese coming along??). Ignas, Hala and Yvonne Krakowiak were saved by visas issued by #Holocaust hero Aristides de Sousa Mendes. This photo was taken at Carnaval time. Yvonne is wearing a traditional Minho dress loaned to her by a sympathetic Portuguese friend of the family, Alberto Malafaia. Forte Santa Caterina - Figueira da Foz 1941. MY SISTER'S EYES - 50 copies gift of the @SousaMendesFdn arrived in #Portugal bound for #FigueiradaFoz #CabanasdeViriato schools. Mariana Abrantes, Treasurer @SousaMendesFdn with Helana Romao, teacher Figueira da Foz High School (above) and Dores Do Carmo teacher UNESCO School Cabanas di Viriato, Portugal (below). Water color of Do Passal (lower right corner) the ancestral home of Aristides de Sousa Mendes by UNESCO school teacher Josefa Reis. Figuiera da Foz Light House of Freedom. Water color of Do Passal, the ancestral home of Aristides de Sousa Mendes by Josefa Reis. Yvonne Krakowiak between two refugee children (left) and four Portuguese friends, Figueira da Foz, 1941. The Kaplan Family of Lodz, Poland. Treblinka? My mother never knew what happened to her family - the Kaplan Family of Lodz, Poland. The last she knew, they had been trapped in the Warsaw Ghetto. Every Yom Kippur she stayed in bed and did not get up. She said, "This is the one day I allow my self to mourn for my family." The rest of the days she lived life. My mother Hala (nee Kaplan) Krakowiak Arnay "ז״ל" died in NYC in 1999. She was saved from her family's fate by a visa from Aristides de Sousa Mendes. 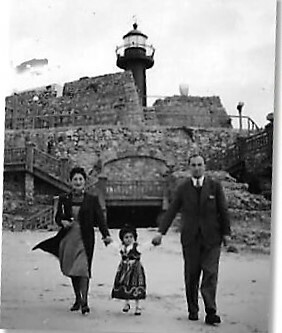 Joan will be presenting My Sister's Eyes: A Family Chronicle of Rescue and Loss During World War II , her family's story, and speaking about the debt of gratitude she feels to Aristides de @SousaMendesFdn for having given them visas for safe haven in Portugal in June of 1940. June 6th and 13th to two high schools in #Portugal.